Right on Placencia Beach, Robert's Grove Beach Resort offers amazing views of the Caribbean Sea and Belize’s barrier reef. This resort has 72 rooms, suites and marina villas, 3 outdoor pools, Sea Spa, full service marina and PADI 5 star dive shop. 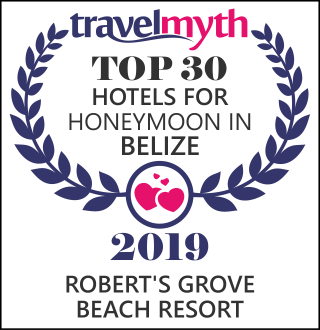 Robert's Grove Beach Resort's brightly-decorated rooms and villas include balconies and sea views. All accommodations have cable TV, air conditioning, a mini-fridge, in-room safe and coffee maker. Suites and marina villas all have a sitting area, a large terrace and kitchens. The resort organizes activities including fishing, sailing, land and sea tours, snorkeling and diving. Sailing and kayaking are also available. The resort’socean front Sea Spa offers a range of treatments including wraps and massage. In a Mexican-style café, overlooking the water, the Habanero Café & Bar serves local and international cuisine. The Seaside Restaurant specializes in Caribbean dishes. Our vacation packages take the hassle out of planning your vacation. Whether you are looking for a romantic getaway, a relaxing beach vacation or an adventure combining the best of the beach and the jungle, we have a package that is right for you. Book a 5 night stay with us, in any accommodation category and pay for ONLY 4 nights! Valid May 1 – October 31, 2019. Robert's Grove Beach Resort offers three delicious and distinct Placencia Belize restaurants — our acclaimed fine dining Seaside Restaurant, Sweet Mama's BBQ and Organic Kitchen and the more casual Habanero Mexican Café & Bar.